Khodiyar Industries holds proficiency in manufactursing Mineral Water Packaging Machine. Our Mineral Water Pouch Packing Machine is highly demanded because of its high performance and excellent efficiency. 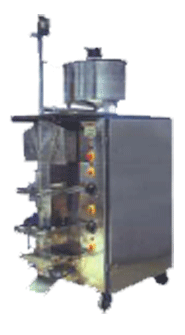 We offer range of Water Pouch Filling Machines applicable in filling oil, butter milk, water liquor, milk, soft drinks and other free flowing liquids. Our Liquid Pouch Packaging Machine is highly probable in working and available in varied specifications to cater to the needs of the clients in the diverse manner. Automatic, Compact and Robust machine. Speed 900 to 2200 Pouch / Hour.